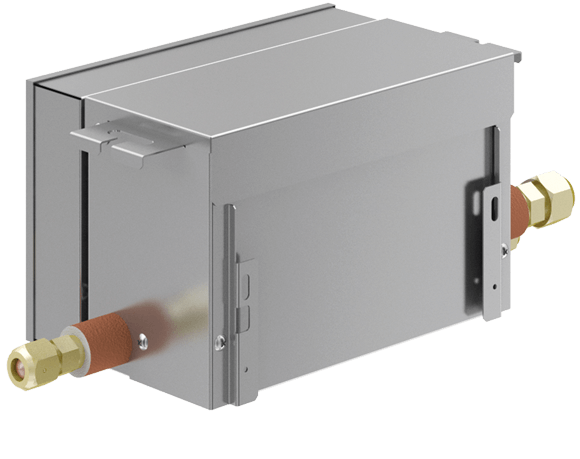 The Change-over Box (COB) is engineered to be the workhorse in a heat recovery system as it redirects refrigerant vapor to the desired zone. 4 ton connects 1-7 indoor units and 8 ton connects 1-8 indoor units. Built-in simplicity since vapor is switched instead of liquid, therefore no condensate is produced which means fewer valves are required. Four electronically controlled valves, and a fully insulated valve housing minimizes noise. Increased reliability since fine mesh strainers protect the valves. Low-noise valve operation means quieter operation and no need to place the changeover box in a remote location. Reliable performance because change-over box continually operates even if one indoor unit on a circuit malfunctions. The valves work according to the demand of each zone. Easy service access to valves with a simplified design.